This is the FREE MARKETPLACE for anything transport related with a connection to Wales, photos, models, actual vintage and classic vehicles, brochures and printed material etc. For more information click the DVD image above. During the period from 1980 until September 1983 I kept a detailed notebook of observations of the South Wales Transport bus fleet. Now, those notes are published for the first time - with appropriate illustrations - in a 41-page A5 pdf e-book on CD. 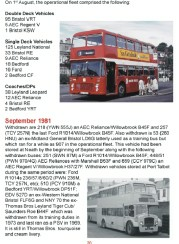 Packed with information, the notes record the demise of AEC, Bristol and other pre-NBC vehicles in the SWT fleet and the introduction of new/secondhand VRTs and secondhand Leyland Nationals. Also recorded are the many hired-in vehicles during this interesting period of SWT history which also included the ABOVE -SAMPLE PAGE expansion of the company's coaching activities . A very reasonable price of 10.99 post and packing paid is the price to Welsh-Transport-Heritage readers. Contact Phil Trotter via his webpage under contacts. www.PhilT.org.uk. Raising funds for Bus Preservation this CD contains colour photographs taken from 1974 to early 1980's features over 50 shots of South Wales Transport vehicles ( AEC Regents/Renowns/Reliance Bristol RE's/MW's, Lodekka's and others). Other operators include Morris Bros, Swansea, ( AEC Regent V's/Leyland PD3's and others), D Coaches of Morriston (ex Lothian PD3's/PD2's), Llynfi Motors (Leyland PD3's, AEC Regent III, Regals), Morris Travel of Pencoed( ex Western Welsh AEC Renowns), R.I Davies & Son( Bristol Lodekka's and Leyland PD2's) and others pictures including AEC Regent V 468 MTX the Double Decker River Jump Bus.